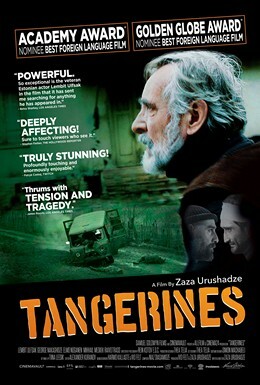 Tangerines, written and directed by Zaza Urushadze, is set during the War in NiAbkhazia (1992–93). Ivo (Lembit Ulfsak) lives in an Estonian settlement in Abkhazia. After war breaks out between Georgia and Abkhazia, most of the people in the village go back to Estonia, but Ivo stays to help Margus (Elmo Nüganen) harvest his tangerine orchard. A gunfight between Georgian and Abkhazian soldiers takes place near his home. He and Margus find only two soldiers still alive, but wounded. One is Ahmed (Giorgi Nakashidze), a Chechen mercenary fighting for the Abkhazians, and the other is Niko (Mikheil Meskhi), a Georgian. Ahmed is determined to avenge the death of his friend, Ibrahim, who was killed in the fight. However, Ivo makes him promise that he won’t harm Niko so long as he is under Ivo’s roof. Ivo then has to maintain an uneasy truce between the two men. Tangerines is the most deeply moving film I have seen in a long time. Much of the film’s emotional power is due to the strong performances of the actors, especially Ulfsak and Nakashidze. This film is a denunciation of the destructive effect of mindless nationalism. It is one ranks alongside of Grand Illusion and Paths of Glory as one of the great war films of all time.